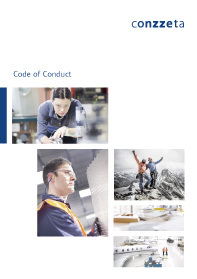 Conzzeta’s Code of Conduct sets forth binding basic rules for conduct in day-to-day business and the behavior of each individual employee toward customers, suppliers, investors, fellow employees, as well as society and the state. It contains clearly defined processes for reporting violations of the rules. All employees are required to be role models. Every year, Conzzeta’s Board of Directors carries out an integral Group-wide risk assessment based on management reporting and the separate Group risk report. Conzzeta’s risk management process encompasses the identification, evaluation and qualitative appraisal of operational, financial and strategic risks in all Business Units as well as at Conzzeta AG. It is supported by risk monitoring, a plan of action and standardized risk reporting. The internal audit function at Conzzeta is carried out by the international auditing firm Deloitte. It reports directly to the Audit Committee. Points raised in connection with the audit schedule approved by the Audit Committee are systematically processed. The relevant control standards enhance the internal control system (ICS) and also contribute to continuous operational improvements.